"What do a large New York Media Firm, the Sixth largest Public Television Station in the USA, a Florida Investigations Firm and a small Home Based Business all have in common?" One thing! They all depend on our Client Contact Management System to ensure they maximize their client contact experience. Hundreds of companies have implemented our contact system to streamline their client contacts and maximize their employee's sales, marketing and support efforts. Our powerful but extremely simple to learn and use system has users up and running in a matter of 10 minutes, eliminating expensive training, consultants and learning curves. 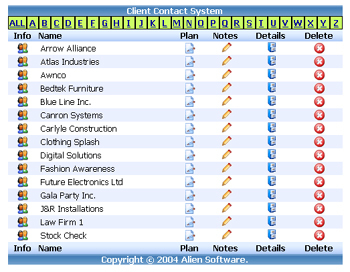 A client contact management system is an essential part of your company success in tracking sales, marketing and support issues. Information can be added from anywhere in the world or link multiple offices to a central database. 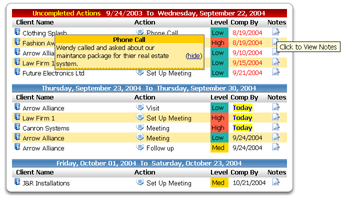 Our system provides complete control over the information added, plus you can set action items to follow up. 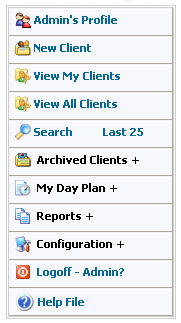 We also include a way to attach documents to the client record. Multiple search functions ensure fast record querying. 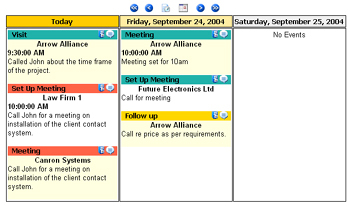 Setting your own contact groups adds to the power of our system. Our Systems are built using industry standard active server pages and powerful MS-SQL or Access databases. Our systems can accommodate from 1 to 1000 users. A few Screenshots of our web browser based system, live demo below. 3 Action Plan views to choose from, Stacked Day Plan, 3 Day View or 7 Day View. Never miss another opportunity! Manage clients, set follow ups, track conversations, send emails, attach documents, images, files and more. 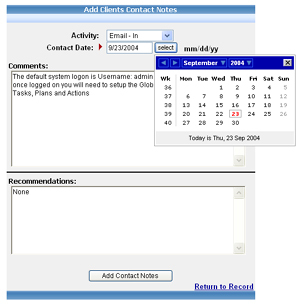 The main client information screen displays all aspects of the clients record. Clients information is displayed in a clear easy to read format for total control over the content and management of the record. Adding client notes is simple as shown below. 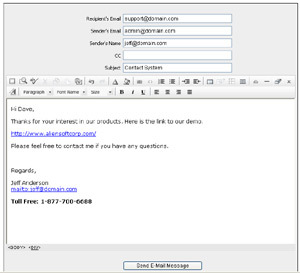 Send Clients HTML enriched emails with our custom email screen. 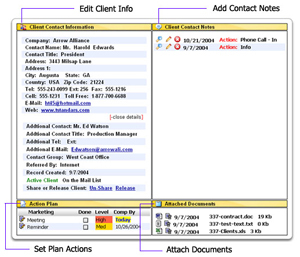 Adds the email message and subject right into the client notes. Try our demos to discover the full power and features of our systems.